Yosuga no Sora Wallpaper: Slept by sun. Minitokyo »	Yosuga no Sora Wallpapers » Yosuga no Sora Wallpaper: Slept by sun. I hope that you will like this beautiful lying sun. I found the scan of the pretty character, then I then carried out the bottom of screen. Browse Yosuga no Sora Gallery: Recent | Popular. 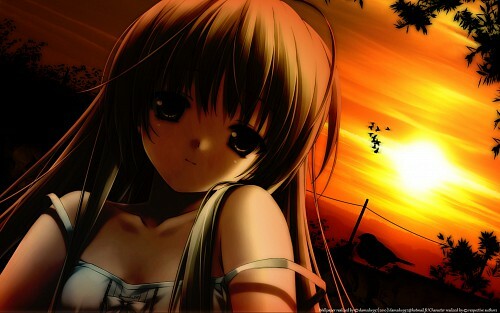 the sunset is so fantastic, very original, beautiful, the girl wow! very cute, an artistic succesful job you did! Its Sora from Yosuga no Sora, original scan located here. The collor effects are very good! is this is "Yosuga no Sora" one of the Anime Charater..? I thank you to all for your comment. It is good u character of this anime xD. thank you for the com! Well, I love sunset >_< great wallpaper!